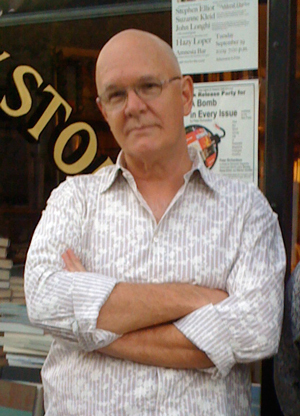 Bill Lavender is a poet, novelist, editor and teacher living in New Orleans. He founded Lavender Ink, a small press devoted mainly to poetry, in 1995, and he founded Diálogos, an imprint devoted to cross-cultural literatures (mostly in translation) in 2011. His poems, stories and essays have appeared in dozens of print and web journals and anthologies, with theoretical writings appearing in Contemporary Literature and Poetics Today, among others. His most recent book of poetry, the ground-breaking verse memoir, Memory Wing, dubbed by Rodger Kamenetz “a contemporary autobiographical masterpiece,” was published by Black Widow in 2011. His novel, Q, a neo-picaresque view of a world in constant economic crisis, appeared from Trembling Pillow in 2013.
dumpsters. At first cowing and regularly beaten, he quickly toughens and becomes a legend of the street and the rails. His many careers include stints as a Christian (glossolalic) rapper, a yacht-hopping jet-setter, and mercenary. His improbable adventures are a parable of our age. Bill Lavender’s Q is a charming, provocative, philosophical picaresque with attitude. In fact, on top of being a parable and an adventure,it’s a very literary exploration of every kind of attitude you would or could want—towards fate, towards materialism, towards our precarious and thoroughly absurd and hellbent times—Q is a joy to read, and a joy to ponder.